My great-grandmother, Sophia Krupa, immigrated to America in 1910 and married my great-grandfather, Michael Bodziony in November 1911. According to her naturalization papers, she was born in Skrudzina, Poland, a small town that was, at the time of her birth (1888), part of Austria-Hungary. When I first learned of her birthplace a couple of years ago, I went to FamilySearch.org to see if they had a microfilm that covered this geographic area and time frame. I saw that they DID have microfilmed records for Skrudzina, but I did not order the film at the time because I had no time to go to my Family History Center and look through the reel. So instead, I ordered a copy ofSophia's application for a Social Security number. Since this form was filled out directly by Sophia herself, it's first hand knowledge of her birth date and parents' names. On it, she lists her birth date as 30 Mar 1888, which is exactly the same birth date as what is listed on her naturalization documents. 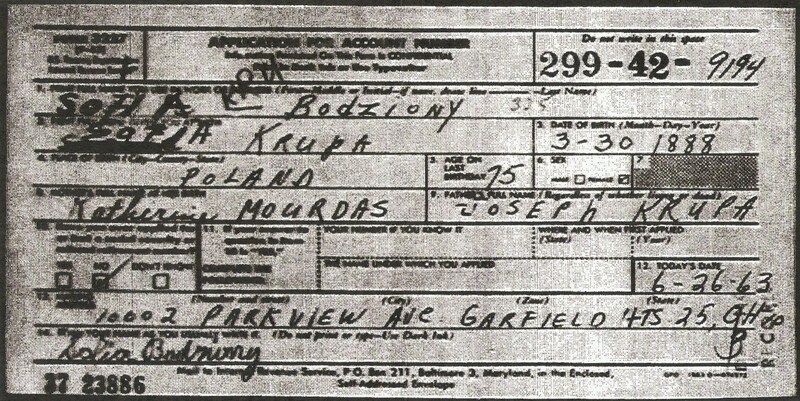 Her parents are listed as Joseph Krupa and Katherine Mourdas. When I was first starting my family tree research, I ran into a bit of a roadblock when searching for information related to one of my paternal great-grandmothers. At first, all I knew was that she was a Polish immigrant who lived in Cleveland, and who died when my grandfather was a young child. All my dad and his siblings knew about her was that she went by 'Lottie.' 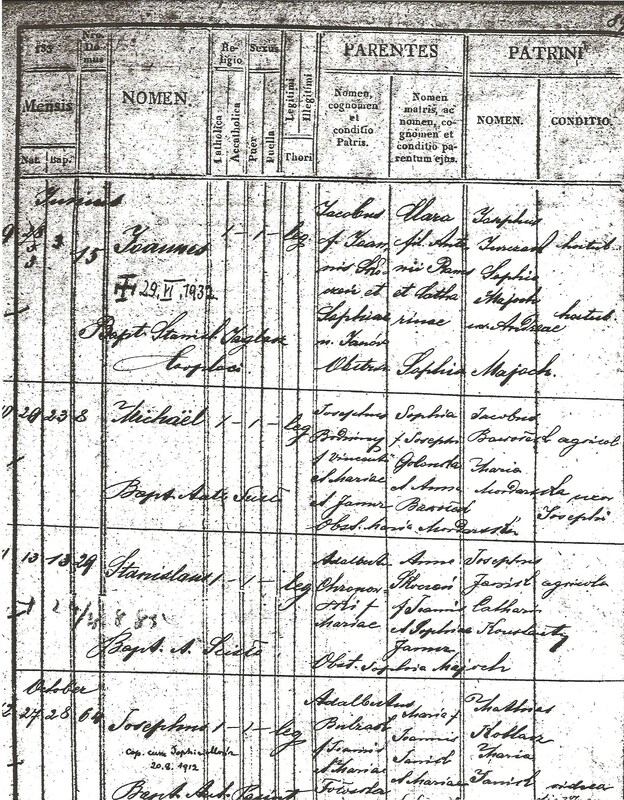 I was able to piece together some clues through other family documents I found: I knew she had died by 1920 because my great-grandfather was listed as "widowed" in the 1920 census. One of my great-uncles obituaries listed her name as "Lottie Gacka," so all right, I thought, now I have her maiden name. I searched the engines on various genealogy sites for Lottie Kowalski (her married name) and Lottie Gacka, but I couldn't find any records that I could definitively link to my great-grandfather. In fact, as I was scrolling through the many records returned by the search engines, I soon realized that 'Lottie' was a common nickname adopted by Polish immigrant women in the late 19th and early 20th centuries. Ok, so literally right after I typed that sentence above about being on the hunt for her immigrant ship manifest, I went to Ancestry.com. Because I knew she was traveling with her sons, I tried searching for the manifest using the name 'Jan Kowalski,' who was her eldest son. I had previously discovered his immigration application papers, so I knew the exact date they entered the country and the ship name. I had to scroll through quite a few pages - 'Jan Kowalski' is literally the Polish equivalent of 'John Smith,' so there were a lot of records - but I found the manifest! Here is Władysława with her three sons, Jan, Stanislaw, and Josef, all listed with her surname of 'Kowalska.' And her father, Stanisław Gacki, is listed as next of kin, so that matches the information on her death certificate.